Shot at the beginning of 2005 during a stay in the Yemen, the film Arabian Stars stages Yemenite citizens crossed according to the journey. The characters agreed to get caught up, to walk in front of the camera by holding cardboard colored posters, on which are handwritten in Arabic the names of famous, real and fictitious, international and local characters (Michael Jackson, Pikachu, James Bond ou Zinedine Zidane but also the singer Abo Bakr Saalem, the poets Al Zubeiri ou Albaradoni, the minister of human rights (a woman) Amat al-Alim al-Susua…) . 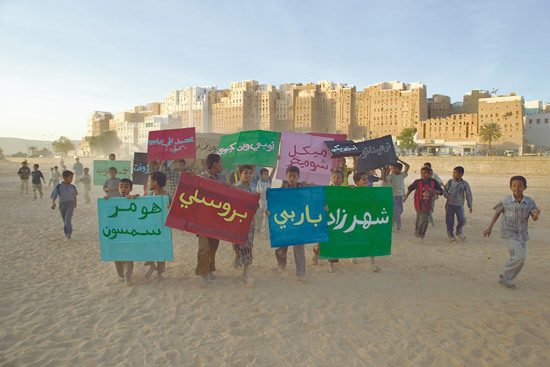 Their occupations interrupted for a moment by this improper gesture, these improvised performers so walk in their daily environment, the cities of Sana'a, Shibam, Aden or the desert. Also, the words in Arabic registered on posters find in these moved contexts a less evident meaning. Of long shots sequences succeed one another, settling the glance in a dilated time. The film is projected in a room repainted in light green, color from Yemenite inside. Eighty-two made different chairs (in echo to eighty-two characters of the film) wait for the spectators. Thirty seven colored posters are hung on the wall.